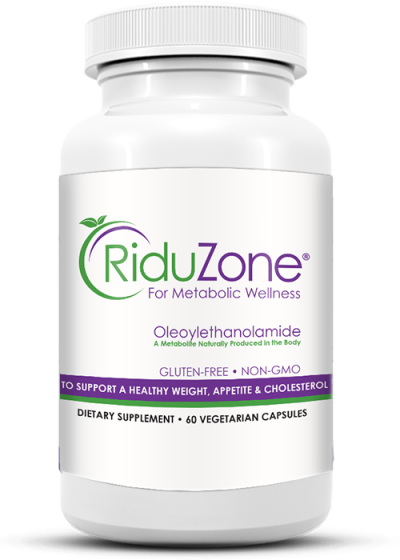 RiduZone is revolutionary, patented supplement that gives your body more of what it already creates - Oleoylethanolamide (known as OEA). OEA is a regulator of appetite, weight and cholesterol. It does so by binding to a receptor know as PPAR-Alpha (Peroxisome proliferator-activated receptor alpha). It is made in your small intestine and helps regulate hunger. In fact, OEA is known to help burn more calories without needing to increase exercise! Each vegetarian capsule will have 200 mg of 90% RiduZone (oleoylethanolamide manufactured by proprietary method). Magnesium stearate, Milk, Eggs, Peanuts, Gluten, Soy and Shellfish. 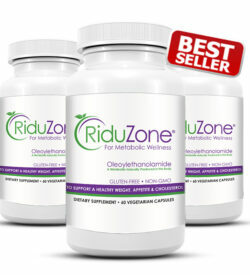 CAUTION: RiduZone is only for use by healthy adults over 18 years of age. Not to be taken by pregnant or nursing mothers. Keep out of the reach of children below 18 years of age. 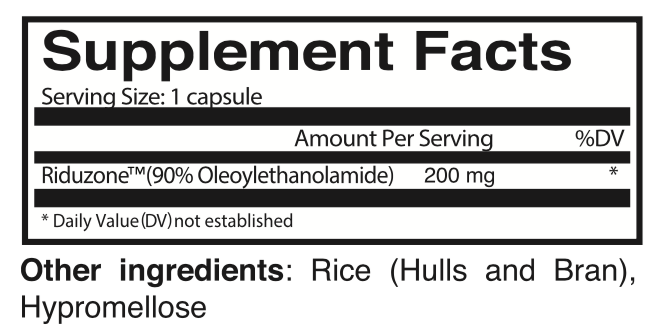 Take 1 to 2 capsules per serving with plenty of water, 15-30 minutes before meal. Take up to two servings per day. Each serving should be 8 hours apart. Take up to 12 weeks.